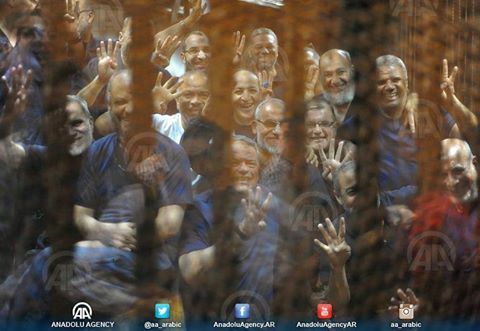 A photograph circulated on social media shows a group of Muslim Brotherhood leaders in prison laughing and displaying the Rab’a four-finger salute. The first temptation is to respect their willingness to uphold their beliefs in face of extreme coercion. But a deeper look into the faces in the photograph highlights the troubles in the Egyptian soul. Every young Copt is indoctrinated into the virtues of “Martyrdom”. The Church, probably the most Egyptian of institutions, calls itself the “Church of Martyrs”, and dates its calendar from time of one of the worst bouts of repression. It is tempting to find an analogy in the Brotherhood narrative. But we need to look deeper, first by looking into the troubling concept of “Martyrdom”. There were two kinds of Christians martyrs, broadly speaking. Those who were asked to renounce their faith, and were persecuted, tortured or killed for it. Then there were those who actively and defiantly professed their faith and challenged the authorities. The first group has to have our admiration. The second group is more troubling. There is an air of moral exhibitionism about such acts, and an underlying assumption of superiority and a desire to coerce others into the individual’s belief. Our attitude toward such “martyrdom” must be very wary. The now famous call of “life, liberty, and pursuit of happiness” stands as one of the clearest moral declarations in history. The sequencing is very important. Sometimes we need to sacrifice our happiness to pursue liberty. Sometimes we need to sacrifice liberty to protect our lives. But our highest duty, individually, familially and socially is to preserve life. If a man is inclined to faith, he may phrase it as honoring God’s gift. If such sequencing is kept at the center of our attention, then we can find a path in the thicket of the current Egyptian sad repression. The Brotherhood members who defy authority, and as a result are jailed or killed for it, are indeed brave. We can offer empathy, but not approval. At the core of their actions is a belief that they are right, and that the rest of society must conform to their views. The Brotherhood ideology, from Al Banna, to Qutb, to today, displays a desire to radically alter the society. Theirs is a historic mission to make a “new man”, one that conforms to their views of godliness. They have actively, and largely successfully, altered the social landscape to their views; making it narrower and more coercive. They were aided by the rest of society; which rarely values individuality, and strongly disapproves of those who forge a different path. This is Egypt’s illness to cure, if progress is to be made. We can respect the Brotherhood for its courage in standing up to society when it finally hit back. But we cannot list its members among admirable “martyrs”. They have long assaulted the two virtues necessary for a free society; respect for individual rights and defense of diversity. The courage to stand up for one’s beliefs does not lessen the odiousness of such beliefs. The willingness to throw lives away in pursuit of less personal liberty is not happiness. Unfortunately you are mixing facts. First life without dignity is not worth living. Second, MB did not defy authority because they were the legitimate authority by free democratic election. Mr. Holland in his recent interview was asked if he will step down from office because his rating level is extremely low, he mentioned that in a democratic system the approval rate is not the governing issue, it is the Ballet Box. MB came with the ballet box so to remove them you should use the same meaning.